Ramblings of an Opinionated Bong...: Should Pepe Reina be allowed to leave? Pepe Reina has been consistently linked with Barcelona ever since Victor Valdes refused to renew his contract which expires at the end of next season. With Reina expected to leave for the Camp Nou, Liverpool have lined up Sunderland’s Simon Mignolet and Stoke City’s Asmir Begovic as potential replacements should the Spaniard leave. Here I have compared those keepers using stats from Opta, via Squawka.com, just like I had used for the comparison between Suarez and Coutinho. But first, there are some important things that one needs to keep in mind about goalkeeper stats. A shot is not always counted as a shot and a save is not always counted as a save. One may have probably watched a Premier League match or two and heard the commentators disagree on whether an offensive player was taking a shot or having a cross. The same thing happens in stats collection —stats collection is merely human interpretation. That’s why some sources have Mignolet making 149 saves, some 150, and Squawka (the source I’m using for this article) has him making 124. Data collection is human interpretation organized, categorized, and quantified but it is not The Truth. Moreover, the data we are dealing with here is very simple. For example, if Coutinho tries a shot but fluffs it and the ball trundles to Sturridge who kicks the ground and in falling over redirects the ball into the net, Sturridge gets a goal and Coutinho an assist. In this table, I have tried to capture most of the data which is relevant to goal keepers. The data is divided into the broad segments- clean sheets, goals conceded, penalties, claims, passes, distribution and errors. Let’s start with the most simple of the categories, the clean sheets kept. Considering the good defenses playing in front of Pepe Reina, David De Gea and Joe Hart, they are expected to keep more clean sheets as compare to Begovic and Mignolet. Despite conceding only 26 goals in 28 appearances, De Gea has managed to keep only 11 clean sheets, i.e. only 39.3% of the time. Begovic performed marginally better than Mignolet, having kept 12 clean sheets compared to 11 in 38 appearances. The next segment is more straightforward- the more porous defenses of Sunderland and Stoke City meant that Mignolet and Begovic conceded more goals than the other 3 ‘keepers. 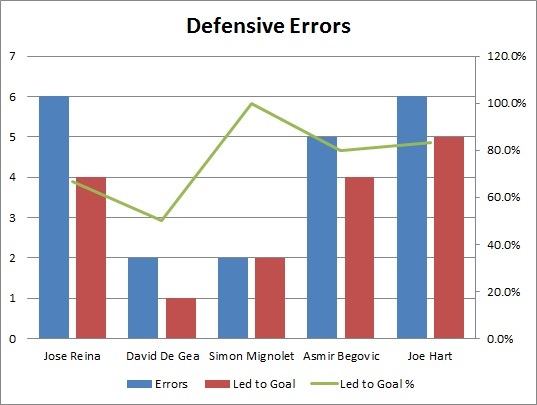 However, if we look at the goals/appearance ratio, De Gea (0.93) and Hart (0.89) are quite better than the other three. 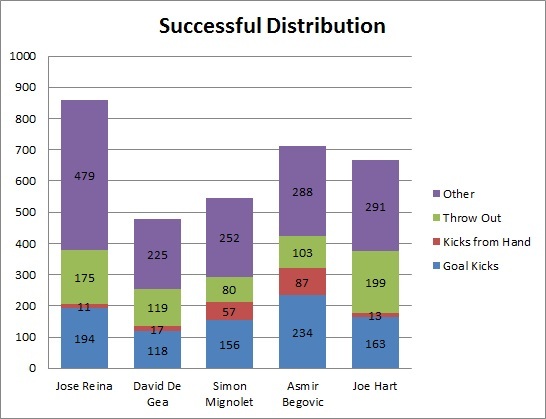 Reina (1.09) and Begovic (1.18) are surprisingly close while Mignolet (1.42) is some way off. If we analyse the goals that these ‘keepers let in, we see that the majority of the goals have come from open play. 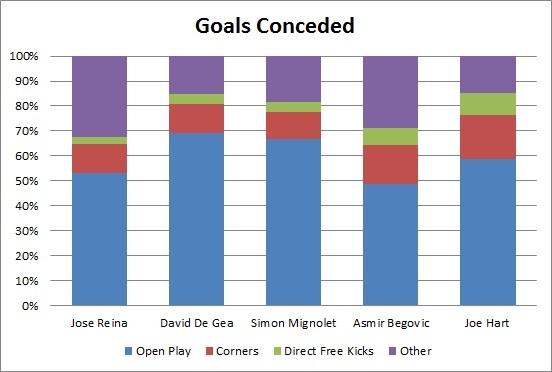 The interesting thing about the goals conceded is that Reina (11.8%), De Gea (11.5%) and Mignolet (11.1%) have let in a very similar percentage of their goals from corners. The figure is higher for Begovic (15.6%) and Hart (17.6%). This probably shows a comparative vulnerability of Joe Hart to corners, although it also has much to do with the defensive set up of the team. As far as defensive setup is concerned, the next statistic is quite revealing- the saves made. While Reina (42) and Hart (45) had surprising few saves to make, De Gea (71) surprisingly made almost as many saves as Begovic (74). Mignolet (124) made 3.26 saves/appearance or a save every 27.58 minutes. The saves/appearance ratio is surprisingly high for De Gea (2.54) and underlines the reason why he found himself in the PFA Team of the Year, his saves helping Manchester United to the Premier League crown despite having an uncharacteristically porous defense. Of all the ‘keepers, only Joe Hart managed to save a penalty all season. The attempted claims figures are quite astonishing for Mignolet and Begovic with them attempting 131 and 129 claims respectively. While Mignolet failed to claim the ball only 3 times all season, Begovic astoundingly was successful in all of his attempted claims. The surprise here though is Pepe Reina; he successfully claimed only 86.5% of the balls he attempted to claim, which is a major reason for some of the goals conceded. I’ll focus on that when I come to the defensive errors section. Passing and distribution are two very crucial aspects for goal keepers as most of the teams look to build attacks from the back or to launch a quite incisive counter attack. This is where Pepe Reina stands head and shoulders above the rest. He has a distribution success rate of 75.4% while his pass success rate is 71.3%. Compare that to the two potential replacements for the Spaniard, and Mignolet’s appalling passing is exposed while Begovic fared slightly better than him. However, the distribution statistics if dug a bit deeper can help reveal the reason for this poor distribution from Mignolet and Begovic. If we look at the average distribution length for the three, Reina (36m) attempts to distribute it much shorter, owing to the passing game employed by Liverpool, while Mignolet (51m) and Begovic (54m) attempt more longer balls in tune with their teams’ more direct build up play. Defensively, Reina, Hart and Begovic surprisingly made a large number of errors, while De Gea and Mignolet made comparatively fewer errors. If we take the failed attempts to claim the ball into account, Begovic’s errors are even more surprising; he was 100% successful when he came to claim the ball. The interesting thing in this matter is that Begovic made only 6 successful punches all season, which is very low considering the number of attempted claims he has made. Mignolet led the League in punches and many people perhaps consider that a sign of weakness. One would rather see the keeper claim than punch, as we see with Begovic who made just 6 punches. But the other side of that debate is whether the keeper is “flapping” at the ball which could correlate with a high error rate though I can’t make that assumption without looking at that as its own metric. Still, I think Mignolet’s punches are fairly important to the overall picture because he has been made to work a lot, and while he conceded a number of goals he also had to make a lot of important defensive actions and only made 2 errors. If we consider the number of saves per error made, Mignolet (62) is the best while De Gea (35.5) also has a very good figure. With Begovic (15.5) now looking now where as assured as a top keeper, what is most surprising is that Reina (7) and Hart (7.5) seem to be highly error prone. These numbers are simply the number of positive actions per negative. Mignolet (5.10) conceded 54 goals, but when one looks at how much he was worked, he actually did pretty well to only concede 54. Pepe Reina (2.68) is pretty poor in this regard. While Reina may yet leave for greener pastures in search of trophies, Mignolet seems to be an able replacement if his passing and distribution stats can be improved upon. That being said, we have to be careful trying to extrapolate how Begovic or Mignolet would fit in at Liverpool. Perhaps Mignolet needs a lot of work to be productive? In fact, Reina has on many occasions made just the one save in a match which may have resulted in a clean sheet or a win.